"Our design can process a lot more natural gas—removing a lot more carbon dioxide—in a shorter amount of time," He says. "These are long-chain polymers, which look like cooked spaghetti noodles at a molecular level," he says. "You can make these cooked spaghetti noodles more rigid, and in so doing you create spaces between the noodles that change the packing structure and the spacing through which molecules can permeate." "We have a new design strategy, where we can tune the bristles on the hairbrush, which allows us to precisely and systematically tune the material," Smith says. 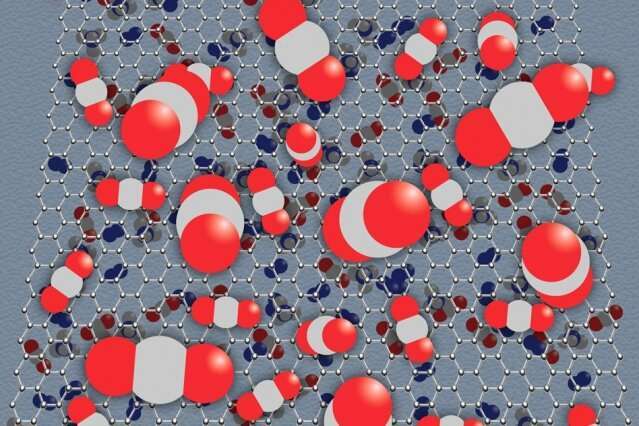 "In doing so, we can create precise subnanometer spacings, and enable the types of interactions that we need, to create selective and highly permeable membranes." Since the side-chains, or "bristles," can be predesigned before being polymerized, it is much easier to incorporate a range of functions into the polymer, according to Francesco Benedetti, a visiting graduate student within Smith's research lab in the Department of Chemical Engineering at MIT. "The performance of the material can be tuned by making very subtle changes in the side-chains, or brushes, that we predesign," Benedetti says. "That's very important, because it means we can target very different applications, just by making very subtle changes." What's more, the researchers have discovered that their hairbrush polymers are better able to withstand conditions that would cause other membranes to fail. "We've seen stability that we've never seen before in traditional polymers," he says. "The membranes from these polymers exhibit very high permeance for several industrially important gases," Xia says. "Further, these polymers exhibit little undesired plasticization as the gas pressure is increased, despite their relatively flexible backbone, making them desired materials for carbon dioxide-related separations." "We are looking for the most effective chemistry and structure for helping the separation process." I wonder if this kind of technology could be used for carbon capture schemes. Separating CO2 from the air or effluent gas streams would be a huge win.